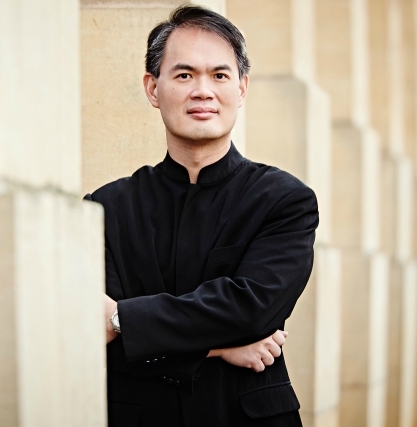 Praised for his deep musicianship, natural authority, exuberant energy and elegance as conductor, Wilson Hermanto has built up a prolific international career. Following his sensational debut with the Cameristi della Scala, effective December 2017 Wilson Hermanto begins his association with the orchestra as its Principal Guest Conductor. Last season with Cameristi della Scala Wilson Hermanto performed several concerts in Switzerland: at Meisterinterpreten Series in Tonhalle Zürich, in Lausanne and Variations Musicales de Tannay as well as in Izmir International Music Festival, Turkey. With Szczecin Philharmonic Orchestra he made his debut conducting Schönberg Pelleas and Melisande and at Teatro alla Scala di Milano conducting the Centennial Anniversary concert of Leonard Bernstein. Recently Mr. Hermanto conducted a production of Mozart Don Giovanni at the Mariinsky Theatre in Saint Petersburg as well as symphony concerts with the Mariinsky Orchestra at the invitation of their legendary Artistic and General Director Valery Gergiev. As a former Boulez protégé Mr. Hermanto conducted Boulez’s 90th anniversary celebration in Geneva with the new music group Ensemble Contrechamps. Wilson Hermanto has a particularly strong profile in France where he appeared with Orchestre national de Lyon, Orchestre philharmonique de radio France, Orchestre national du Capitole de Toulouse, Orchestre de chambre de Paris, Orchestre national de Lorraine, Orchestre symphonique de l'opéra de Toulon, Orchestre national d’Île de France, Orchestre symphonique de Bretagne, Orchestre symphonique de Nancy as well as at Festival de la Grange de Meslay. Other notable highlights include performances with Deutsche Radio Philharmonie Saarbrücken for televised Richard Strauss program celebrating the composer’s 150th anniversary, the Prague Symphony Orchestra for critically acclaimed Ravel complete Daphnis et Chloé, the London Philharmonic Orchestra, the BBC National Orchestra of Wales, Orchestra della Svizzera Italiana, Orchestre de chambre de Lausanne, NDR Radio Philharmonie Hannover, the Ulster Orchestra in Belfast, the English Chamber Orchestra, Orchestre de chambre de Genève, the Malaysian Philharmonic Orchestra, Symphony Silicon Valley in San Jose, California, Schleswig-Holstein Festival Orchestra with the pianist Lang Lang, Orquesta filarmónica de Bogotá, Orquesta filarmónica de Jalisco in Guadalajara, Mexico and Verdi Requiem with the Moscow Symphony Orchestra at the Grand Hall of the Moscow Conservatory. During the 2 year celebration of the anniversary of Gustav Mahler in 2010 and 2011 Wilson Hermanto together with the world-renowned Mahlerian musicologist Prof. Henry-Louis de la Grange, the legendary mezzo Christa Ludwig and Sinfonietta de Lausanne curated Mahler Projects for Suisse Romande which culminated in Mr. Hermanto’s performances conducting the composer 1st and 4th symphonies, the orchestral songs, in addition to masterclasses and symposium. Jacques Offenbach Orphée aux enfers was staged in Geneva in a successful collaboration that saw Mr. Hermanto conducting the production of stage director Stephan Groegler in 2011. Born in Jakarta, Indonesia of Chinese descent, the Indonesian-American Wilson Hermanto’s musical training began with the piano and the violin. He graduated from the Peabody Conservatory of Music majoring in violin and pursued conducting study from the Manhattan School of Music with the late Swedish Maestro Sixten Ehrling. Sir Colin Davis became a close musical mentor who took personal interest in shaping Mr. Hermanto’s conducting skills. Mr. Hermanto was also one of the last pupils in the famous conducting class of Maestro Carlo Maria Giulini at Scuola Musica di Fiesole in Italy, a conducting Fellow at the prestigious Tanglewood Music Centre and a Fellow at the invitation of Pierre Boulez to work with the Maestro at the Lucerne Festival Academy. Early in his conducting career Wilson Hermanto founded and led the Prometheus Chamber Orchestra in New York from 1996-2002. With the Young Musicians Foundation (YMF) Debut Orchestra in Los Angeles, following the illustrious roster of their former conductors such as André Previn, Michael Tilson Thomas, Myung-Whun Chung, Mr. Hermanto was the orchestra Music Director from 1999-2002. Thereafter from 2002-04 Mr. Hermanto served as the Assistant Conductor/ Staff Conductor of the Cleveland Orchestra under Franz Welser-Möst. He made his debut at the Blossom Music Festival appearing with the Cleveland Orchestra in 2003. In the field of opera Mr. Hermanto’s debut as a conductor was in a production of Humperdinck Hänsel und Gretel in Los Angeles in 2000. [Wilson Hermanto] has a clean and elegant stick technique, a tendency to point dramatically with his left hand, and a consistently encouraging smile for his musicians. More important, he has ideas about music. Nearly an hour in length, Ravel’s “choreographic symphony” is an incredibly complex work that demands a large orchestra, full mixed choir and considerable finesse at the podium. Hermanto, responded with a display of poise and talent well beyond his years.